A tiny village enclosed by mountains, pine forests, and fields, Sant Llorenc de Balafia (or San Lorenzo) is nestling beautifully in the middle of the island. San Lorenzo de Balafia property is ideal for those looking for a tranquil lifestyle on a beautiful island. The properties found in the area mostly include renovated authentic fincas and estates, set in idyllic Mediterranean gardens with palm and fruit trees. Second home buyers are choosing San Lorenzo for its privacy and traditional laid-back atmosphere, yet being located in a close proximity to the variety of services and leisure options that the island has to offer. A price for a house on San Lorenzo de Balafia property market is below region’s average and hovers around Average price per sqm. in Sant Llorenc de Balafia €9,475 0% properties#: 22 last change on: 23 Apr 2019 €9,475 per square meter. There is a premium value on houses with a privileged sea view position in the area. The most renowned real estate agencies in San Lorenzo are Luxury Villas Ibiza, VIS Ibiza and Ibiza Properties for Sale. Why San Lorenzo de Balafia property? The name Balafia dates back to the time when the Moors ruled on the island. Despite its position, San Lorenzo had a quite restricted capability for maritime trading, but the Arabs recognized the agricultural potential of the land. Surrounded by cultivated fields, San Lorenzo still retains the air of being unspoiled with the course of time and proves that there are still well-protected areas in Ibiza. There is so little going on in this sleepy village, but this only adds to its charm and peaceful vibe. Here, you are able to enjoy a feeling of time standing still whilst surrounded by enchanting views of fields of red earth and lush green rolling hills of the northern Ibiza. Although it is a very tranquil area, the high-quality resorts and beaches can be accessed within minutes, which opens up a completely another world. The northern coastline is full of cliffs and some beautiful coves, and so it is not a problem to find a nice spot to relax outside of San Lorenzo. For example, the three main beaches found in the main resort areas of San Juan municipality, such as Cala Portinatx, Cala de Sant Vicent and in Port de Sant Miquel are easily reachable in 20 minutes driving. Also, nearly you will find many idyllic coves (‘calas’) of Xarraca, Benirrás, S’Illot, d’en Serra, and Moltons. Conveniently, San Lorenzo is just approx. 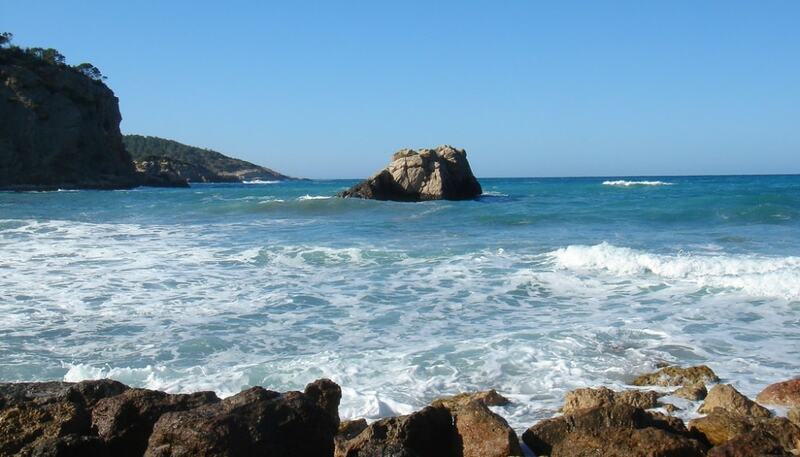 17 km north of Ibiza Town and 23.2 km from Ibiza Airport. 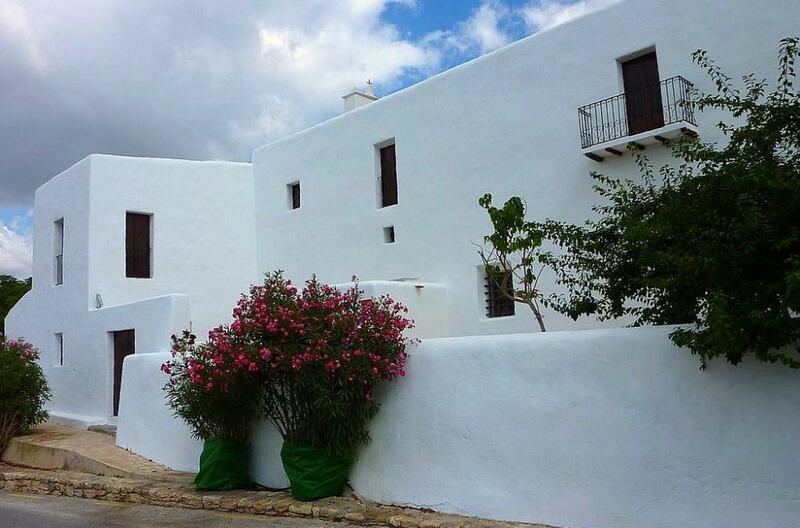 This small rustic settlement features one of the great examples of typical northern Ibiza architecture. The ancient centre of the village is composed of an eighteenth-century church, five traditional Ibicenco houses, and two defensive watchtowers of high archaeological importance, but not much than that! Interestingly, some of the buildings have white crosses on their façades, which was an ancient custom to defend them from the attacks. 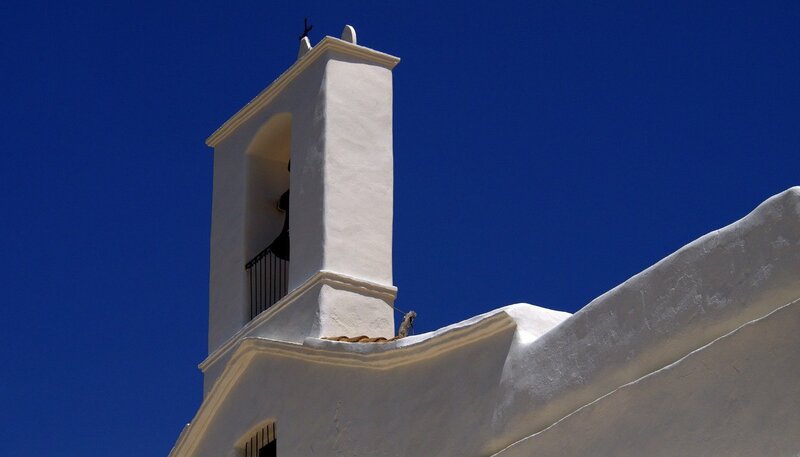 Likewise in most towns of Ibiza, life here revolves around the beautiful white church, which is the main sight in San Lorenzo. Near the top of the church, is a small recreational park called Can Pere Mosson. It is great for walks, but please note that dogs are not permitted. There are just few restaurants, but notable with a very homely atmosphere. 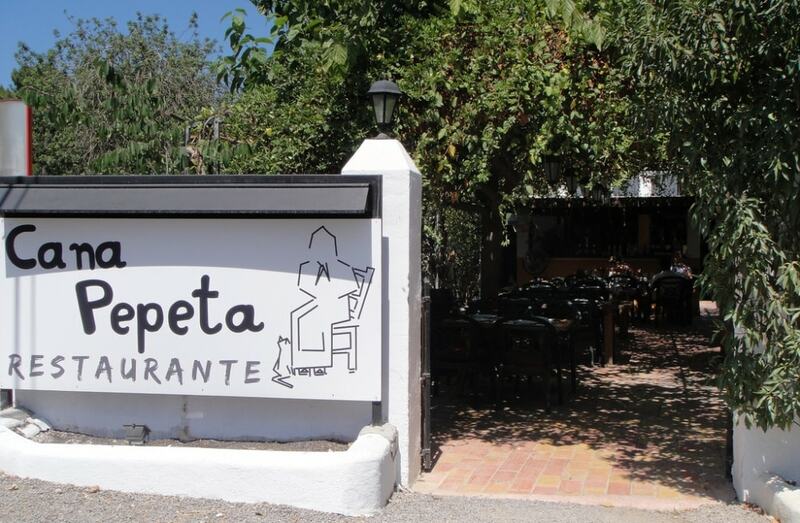 Cana Pepeta is great for an authentic tapas experience. In turn, the iconic La Paloma Café is a firm favourite. It is well-known in Ibiza for its fresh organic food and delightful atmosphere. Nevertheless, this charming sleepy village becomes vibrantly alive during its main festivity of Patron Saints’ Day, celebrated on the second week of August each year. It features music, folk dancing, performed by local dance group in traditional costumes, tasting of local sweet treats (such as orelletes and buñuelos), a spectacular firework display, and much more. This is a very traditional fiesta, but you will receive a very warm welcome should you want to join it!